The Jackdaw (Corvus monedula) is the most widespread of the small corvids. The Jackdaw is an engaging and opportunistic feeder, quick to exploit and new food source. It walks with a characteristic swagger and is acrobatic in flight. Outside the breeding season, it forms flocks. The sexes are similar.The adult has a mainly smoky-grey plumage that is darkest on the wings and crown; at close range, the pale blue-grey eye and grey nape are visible. 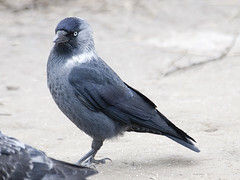 The Jackdaw is a widespread and common UK resident. It seems equally at home on farmland, on sea cliffs and within towns and villages. Apart from the availability nearby of areas of short vegetation for feeding, the common factor is the presence of holes and cavities for nesting; caves, rock crevices, old buildings and even chimneys are frequently used. Several hundred thousand pairs probably breed in the region. Outside the breeding season, influxes of birds from mainland Europe boost the numbers and more than a million birds are probably present during the winter months. There should be little difficulty finding Jackdaws in the region, regardless of the season. This species is most impressive when seen in acrobatic flocks on sea cliffs in the west of the UK. The Jackdaw utters a characteristic chack call. Sterry.P., (2004) Collins Complete Guide to British Birds. Harper Collins Publishing Ltd, London.